France 2 TV journalist Charles Enderlin told a small audience at Harvard’s Center for European Studies today that Yasser Arafat had faked his blood donation to the victims of the September 11th attacks. Enderlin said the event had been staged for the media to counteract the embarrassing television images of Palestinians celebrating in the streets after the World Trade Center and Pentagon attacks. The blood donation story made headlines around the world. It was reported by esteemed news agencies like the BBC, and photographs of Arafat lying with an outstretched arm ran on many front pages. But the whole scene was staged, Enderlin said. 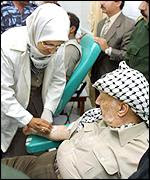 Arafat didn’t like needles, and so the doctor put a needle near his arm and agitated a bag of blood. The reporters took the requisite photographs. I followed up this extraordinary revelation by asking Enderlin two questions. First, if you know that the story of Arafat donating blood was fabricated, why do you reject any possibility that the shooting of Mohammed al-Dura was staged as well? And second, why did you delete several minutes of raw footage from the Al-Dura tape when you handed it over to the French court in the Karsenty libel appeal? Al-Dura was killed before a live correspondent, the day after Israelis opened fire on demonstrators on the Temple Mount. My journalist filmed this kid dying in front of the camera. The video is authentic, we had other witnesses, we had an Israeli military reaction that admitted it was probably them. We broadcast all the relevant reactions from the Israeli army. 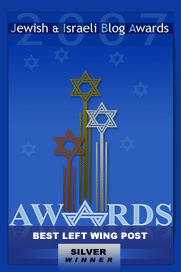 In November I suddenly heard that an Israeli general was reconstructing the events. The video rushes don’t show you exactly what is happening. So in November a general said that the probability was higher that he was killed by a Palestinian bullet than an Israeli bullet. Then in Septemer 2002, a campaign started. People started saying that the event has been staged. It has not been staged; it is authentic; it has a time code; and if it has been staged, then the father is not injured and the doctors in the chief hospital are staging the events, and then when the father was brought to a military hospital in Amman where King Abdullah visited him, so King Abdullah is part of the conspiracy, and then the Israeli journalists interviewed the father. We sued for libel, and we won, and on appeal we were told to hand over the rushes. It was thought that there were 24 minutes, but we discovered that the rushes had been recorded on a film that already had something on it. So we presented to the court the 18 minutes of the original cassette, and now the story is that the kid is alive, and the father is inviting anyone to go and check the remains in the child’s grave. Today there are generals who say they believe it is fake, but at the time they believed it because they saw the images. Well, does anybody believe that Israeli generals learn things by looking at images on the television? So, we have several libel suits going on. We have won 2. Someone accused me of encouraging the assassination of Israeli children, and if that’s not libel then I don’t know what is. It’s clear that Enderlin knows he is on shaky ground, because he is resorting to the flimsiest of straw-man arguments. No one has said that Mohammed al-Dura is alive (though a few are starting to wonder). His death, though sad, is actually irrelevant to the question at hand—namely: does the footage that Enderlin aired on France 2, and sent around the world, actually show Israeli soldiers shooting al-Dura? Landes began a strident reply, and the moderator interrupted, allowing Enderlin to continue. “You are part of the smear campaign,” Enderlin snapped. “It’s called criticism,” Landes retorted. Enderlin continued, claiming the soldiers had been shooting for 45 minutes. “I am willing to go in for a polygraph,” he said, with the sympathetic audience chiming in to protect him from Landes’s questions. It’s amazing that Enderlin can recognize that news events were being faked at the highest levels of the Palestinian leadership, and yet refuse to allow that the al-Dura killing may have been similarly staged. The obvious explanation is that Enderlin’s name is on one and not the other. The Arafat blood donation story may be rather harmless, but the al-Dura story continues to create hatred and death. I don't think that it was possible for the IDF to know that there were non-combatants where the al-Duras were. Still, given the location of the barrel, it looks like an impossible shot for the Israelis to have hit the al-Duras. Why was Arafat's fake donation not a news story? Well, does anybody believe that Israeli generals learn things by looking at images on the television? The generals were faced with video evidence of the killing and in all likelihood, an inability by the field people to categorically deny the event. Naiveté about the truly malignant nature of France2 reporting would fully explain their reaction. The initial admission of probable guilt implies honesty within the Israeli military reporting system. This is in fact normal for democratic countries and abnormal within autocratic political entities. The alternative to this is that "the generals" ordered up brutality, something Enderlin would obviously like to have us believe. excellent post. i've put my notes and comments up at the augean stables. Is this being picked up by any MSM? I tried putting this information in the WP article and it was removed because you're not a "reliable source", but if it was reported in a newspaper somewhere, that becomes a source WP can cite.